Disclaimer: this review offers no context for the film's narrative and a number of my comments on that score, making the assumption you have read my earlier review of the novel. I realize it's considered bad form to start off a review of any piece by lambasting it for its weakest element, but I cannot tell you just how tempted I was to entitle this critique "Shake Shake, Shake Shake-a-Shake It." Of all the major tentpole films in recent decades that have tortured the audience with madly aggressive handheld camera work, The Hunger Games is surely the most egregious offender, and small wonder coming from the cinematographer who brought us the incomprehensibly muddled rugby sequences of Invictus. Good luck following any of the actual action in the action flick portion of the film (i.e. the entire third act), and to the easily motion sick among you I recommend skipping the greasy popcorn this time around. Additionally, I should warn any of you with editing experience or cinematographic aspirations to prepare yourselves from aneurism at the breakneck cuts between the various handheld angles, even when they manage to defy all story logic and to sever continuity of action. Still, while the shoddy camerawork and editing may mar every moment of motion in THG (which are, admittedly, not quite as abundant as you might think if you have seen only the trailers and never read the novel), the mise-en-scène of the first act act is nearly skillful enough to compensate for it. The opening shots of an impoverished, post-post-industrial Appalachia establish in seconds a desperate, pervasive quietus that colors and contextualizes the (initially) sparse dialogue every bit as effectively as did Collins's prose. Harsh browns and yellows of torn and faded clothing clash with the verdant green of the forest to reveal a humanity humbled by its own sins and betrayals, a pitiful remnant of civilization clinging to a newly victorious wild, whose trees stand sentinel opposite the too-clean white of the Capitol officers. In the case of the first thirty minutes of THG, a picture truly is worth a thousand words. The subdued anguish of these early scenes is embodied nowhere more effectively than in the haunting complexion worn by Jennifer Lawrence, a shoe-in for her second Academy Award nomination and strong contender for the award itself, if I may be so bold as to mention the possibility in March. 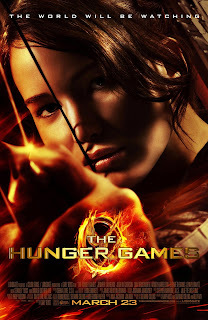 Yond Katniss Everdeen has a lean and hungry look, and if Lawrence's eyes perhaps do not contain the latent danger I pictured from my reading, they certainly reveal a cold sort of fire that is equally unsettling. Yes, you troubling naysayers, Lawrence is perhaps a healthier weight than would be expected given her character's circumstances and the descriptions of the text, but it is unreasonable and reprehensible to hold all Hollywood stars to the metamorphic – and downright dangerous – physical standards of the kind held by Christian Bale for his method. Morally disquieting criticisms of her physicality aside (and yes, she is almost certainly the wrong ethnicity for the part), Lawrence delivers a stunning performance to put the collective cast of the Harry Potter franchise to shame. Every look, every line is delivered as Katniss, and her hyper-expressive eyes reveal as pathos every bit as powerful as the desperate opening landscapes, entire generations of unseen oppression weighed in every half-pensive, half-smoldering look. What a shame, then, that Lawrence's dramatic weight is arguably the film's only impetus to move its meaning beyond the opening act. Were we to sever the first half hour or so of The Hunger Games from its culmination, we might be left with a compelling short sci-fi flick on the psychological effects of systemic oppression, a study in the desperation of subsistence and the poignancy of self-sacrifice. Alas that the show must go on. Other than a moment of appallingly bad CGI, there is little to complain about in the second act save for its interminability and lack of imagination, but the third act not only manages to careen into a madcap handycam misadventure but to betray the entire core concept of the story in the process, and to do it in the laziest way possible to boot. That is a strong claim, so allow me to elaborate. Those of you who read my review of the novel might recall some of my descriptions of social commentary in THG, including its harsh deconstruction of consumerist culture in the western world and specifically the degeneracy of the entertainment industry. Perspective: The Hunger Games is a movie about children forced to fight to the death for the reality TV kicks of an callous, morally debased bourgeoisie. Twenty-three of them are brutally murdered, usually on-screen. Unironic comment I heard from a eight-to-ten-year-old child walking out of the theater with his parents: "That was so AWESOME, Mom, can I get a bow and arrow? "His mother laughed, of course. Kids say the darndest things, right? Suffice it to say that the moment brought new meaning to the phrase "a culture of death," and certainly not in the way Pope John Paul II might have used it. We can talk all day about the distinctions between Morality and Art – and I have, believe me – but in this case it's a rather moot discussion since THG isn't particularly good art anyway. It's a poorly filmed, well-acted, occasionally gripping but mostly-just-functional action flick about kids killing each other. No, it's not high art, but it's pretty decent spring-blockbuster entertainment. And what's really disturbing about it is that it's not disturbing. Everyone and their mom remembers being forced at some young age to stomach their way through Golding's Lord of the Flies in either novel or film format (usually both), but did any of us actually enjoy it? I don't mean "enjoy" in the sense of an aesthetically moving experience; I mean "enjoy" as in "have a swell ol' time." And I'm guessing the answer is a fairly unanimous "HELL no." Lord of the Flies is enjoyable in the same way a root canal is; it's painful as anything to get through, but the hope going in is that you'll in some way be a better (or in this case more educated) person at the end of the ordeal, or at least more prepared to deal with some of the darker elements of human nature. The Hunger Games novel was a similar experience for me, albeit a more intense and readable one than Golding's ponderous piece of the canon. The Hunger Games film, however, was a different animal altogether, not a horrific ordeal to induce frightful contemplation but an invigorating PG-13 survival adventure piece in the vein of Swiss Family Robinson. A film that downplays the horror of desperation and frenzied murder in favor of the "fun" of the thing or the totally badass way Katniss can put an arrow through an eye a hundred yards out. Also, teen romance, because nothing says Hollywood integrity like transforming a complex, calculated survival relationship facade to a grab for Twilight's piece of the teenybopper pie*! Total inversion of its original media message aside, eminently unadventurous director Gary Ross misses almost every opportunity to turn the latter half of his film into something artistically worthwhile. Never mind the "meaning" of the reality TV conceit: Ross fails to take advantage of its film potential in anything more than the most cursory fashion, throwing us a few overindulgent clips of the "gamemaker" control panel and Donald Sutherland's paycheck while ignoring the manifold opportunities of the television format itself, to say nothing of capitol reactions beyond sweeping views of Stanley Tucci's character's studio audience (a Caesar Flickerman whom he handles quit well, admittedly). What we are left with is as generic an action adventure set as anyone could have concocted, complete with a climax that not only flaunts its pathetic CGI budget but openly flouts the novel's original depiction of the hybrid child-wolf monsters in the most insulting way possible. In the end, The Hunger Games is a wasted opportunity with little hope for sequel improvement unless Ross is torn from the helm by some act of divine mercy. Those who haven't read the book and do not intend to do so might enjoy this well-acted, artificially vanilla-flavored Hollywood teen flic, but fans are are advised to enter with low expectations if they must enter at all. Arbitrary Numerical Score: 6/10 as a film (mostly for the first act), and 4/10 as an adaptation. * And may God have mercy on the soul of whoever is responsible for that vile marketing label. Well I just watched the movie recently. The camera shaking thing is spot on... I understand the intent, but it was more confusing than anything. Basically just left to accept the fact I know that *something* is happened, and I guess I'll get to see how it ended in a minute or so. Even in the beginning of the movie where they are just showing us the areas the "peasants" live in, it's just so frustratingly shaky. Maybe professor layman has started working in the movie industry. Everything else was just straight up cheesy if you ask me. Like I thought the movie royally sucked. I'd have an easier time accepting that the capital was a new addition to disney world than a futuristic empire. I don't even know where to begin on this part. The people looked like something out of alice in wonderland. It was just all so unconvincing. The way they portrayed interaction between the characters was horrible too. The group that teamed up with Kato was pretty much a group of jocks out of the movie Grease- a phenomenon of overacting unrealistic bullying accompanied with ridiculously corny insults and taunting. It was just TOO obvious who the director wanted us to like and hate. "Look at THIS character eh!? Who would want to be like HIM!?" Okay. I'm not six years old. And the whole talking-to-your-victim-right-before-you-kill-them element. When the knife-throwing chick has a dagger at Katniss throat, she firsts decides to taunt her, which isn't necessarily over the top. Then she demonstrates some sort of out-of-place selfless loyalty to Kato and his crew, then she says something to the extent of "now I'm gonna kill you". Then, for some reason, she thinks she needs a SECOND knife to do this with. Fortunately for Katniss though, knife-throwing-chick has to lift her knife WAY over her head and hold it there so that the really cool black guy (who should've been filmed more) can conveniently come kill her by banging her into a wall. Without restraining her dual-wielding hands. That she for some reason doesn't use to stab him with. This is also exactly what happened with Kato... A bunch of staring down, slow walking, non-use of his sword so that he can instead THROW his victims around until they come up with a plan to kill him. Why the hell does he hold Katniss's head over the edge of that ship-or-whatever? HE HAS A SWORD IN HIS HAND. What, did he forget Peta was right behind him? Pathetic action sequences. This is just the surface layer of this films failures.